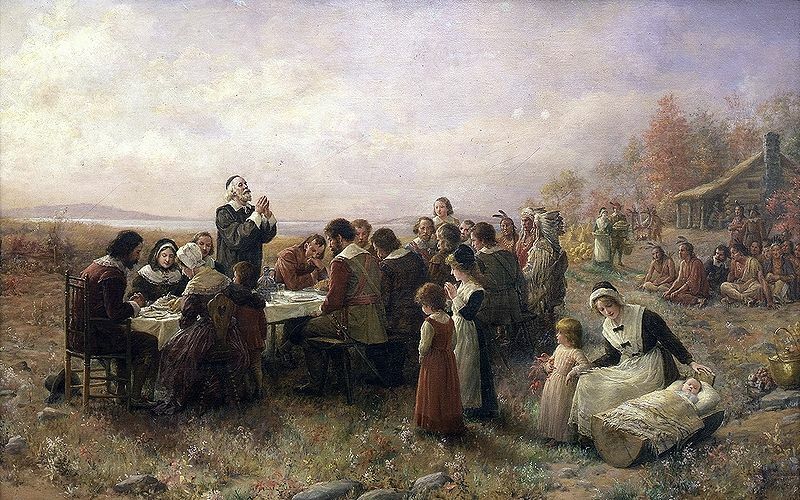 “The First Thanksgiving at Plymouth” (1914) By Jennie A. Brownscombe. Source: Wikimedia Commons. We all know Thanksgiving as the day the Pilgrims of Plymouth celebrated surviving their first year in the Americas by inviting their Native American friends over for three days of feasting and games, but the truth is a little more complex than that. While constant raiding and warfare between Native Americans and English settlers plagued the other colonies, the people of Plymouth were enjoying a feast with their indigenous allies. How did that happen? Well it involved a lot of tragedy, death and political intrigue. Today we’re exploring the true story of the first thanksgiving this week on Beyond Bones. The story begins with a group of religious dissenters fleeing religious persecution in England. They called themselves Separatists because they believed they should have the right to form their own congregations outside the Church of England, an institution they felt preserved too many Catholic rituals. Unfortunately for them it was illegal to be anything but Anglican in England. The Separatists migrated to Holland for 11 or 12 years before deciding the try their luck in the New World, where they could stay British (apparently they feared becoming too Dutch) while still being free to practice their religion. They reached an agreement with the Plymouth company and in the Summer of 1620 a small group of around 50 separatists, along with a ragtag group of recruits from the general public, set sail on the Mayflower for Virginia, ultimately arriving in present day Massachusetts. They arrived in late fall and settled in an abandoned Native American village. During their first winter, 50 of the 102 Mayflower passengers died from disease and malnutrition. Samoset comes “boldly” into Plymouth settlement. Woodcut designed by A.R. Waud and engraved by J.P. Davis (1876). Samoset was the first Native American envoy to visit with the Plymouth Plantation Settlers. Source: Wikimedia Commons. At some point in early 1620, Native American envoys began visiting with the settlers. One of these envoys, named Sqaunto, or Tisquantum, spoke some English. Squanto’s story is quite the tragedy, with the epic climax occurring about two years after he first met the Plymouth colonists. He had been captured by English adventurers when he was a young man and sold into slavery in Spain. Eventually he gained his freedom and returned to his homeland after around 5 years in servitude. Upon reaching home, however, he learned that most of his people had been wiped out in a smallpox epidemic in 1617-18. In fact, the abandoned village that the Plymouth settlers discovered and built over had been wiped out by the epidemic. Some sources say the village had belonged to Squanto’s people , the Patuxet, but that fact can’t been confirmed. At some point thereafter Sqaunto was enslaved by the Wampanoag Confederation, a group of tribes under the leadership of sagamore Massasoit, who was a sort of high chief. When word of the English settlers at Plymouth spread to the Wampanoag, Squanto convinced Massasoit that he could help negotiate a peace with the foreigners. Squanto traveled with the leader to Plymouth and helped to broker an alliance between the two parties. In the Agreement of 1621 the Wampanoag agreed that if a crime was committed against the English, they would send the perpetrator to the Settlers to be punished and make reparations (around this time they returned several tools which they had stolen from the settlement) and they also agreed that if Plymouth should fall under attack from any other tribe, they would defend them. Crucially, the English agreed to those same terms. 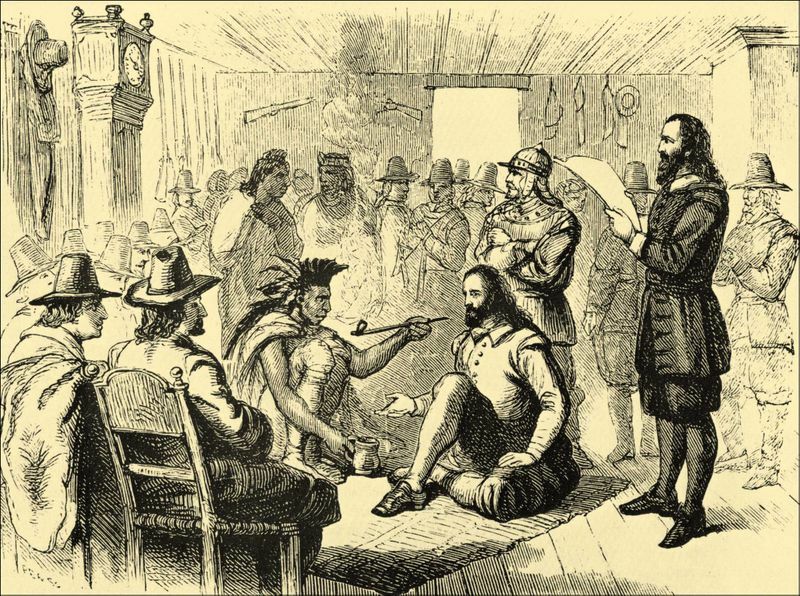 Massasoit and governor John Carver smoking a peace pipe. Artist unknown. Source: Wikimedia Commons. The Wampanoag Confederation was in trouble by 1621, the smallpox epidemic that had wiped out Squanto’s people had killed many many of their people as well. Their neighbors to the North, the Narragansetts had suffered fewer losses and with their superior numbers held an intimidating military advantage. Massasoit was desperate to preserve his territory, so he made peace with the English. This was a controversial decision that was not supported by several village chiefs. To put things into perspective, the year after peace was brokered in present day Massachusetts between the Wampanoag and the Plymouth Colonists, the Powhattans massacred more than 300 colonists in Virginia in response to repeated massacres and raids against them that had been carried out by the English in the previous ten years. So Anglo-Native relations at the time were strained to say the least. The Wampanoag had plenty of reasons to distrust the settlers, but the Confederation’s precarios position called for desperate action. Original documents written by William Bradford, a former Governor of Plymouth Colony, mention that the Wampanoag were very interested in aquireing firearms, more evidence of their desire for a military advantage, but that the English were reluctant to trade them. Another interesting occurrence mentioned in the paper is Squanto’s power grab and subsequent fall from grace. The relationship between the Wampanoag and the Plymouth Plantation, along with Squanto’s prestige, reached its peak in the fall of 1621, when the legendary first Thanksgiving occurred. The original Thanksgiving feat lasted three days and was attended by a congregation of colonists and some of the most powerful men in the Wampanoag Confederation. The books we read in school tend to depict the Native Americans as simple people who live in harmony with the land, and give the sense that the indigenous attendees were just random Indians. But in reality the feast was a highly political affair and Massasoit was joined by 90 of his countrymen, most likely a mixture of warriors and important chieftains. The English settlers presented a brief display of military maneuvers by their militia and fired off a few rounds in a display of strength. The first thanksgiving was a celebration of a successful military alliance, with all the pageantry associated with such events. The relationship between the Wampanoag and the Settlers of Plymouth Plantation had profited both sides, the settlers had been taught how to plant indigenous crops such as corn, Squanto had showed them how to fish and hunt in the alien wilderness and in times of need the settlers could depend on provisions supplied by local tribes. Starvation and disease were no longer threats to the Settlers, even in the winter months. The natives had also traded goods such a beaver pelts which were highly sought after in Europe, thus helping the colony turn a profit. How Well The Corn Prospered. 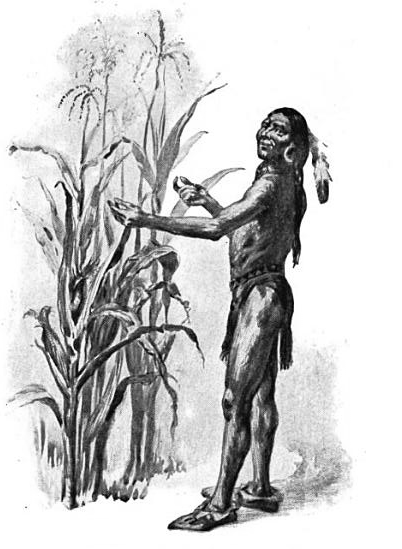 Squanto or Tisquantum demonstrating corn he had fertilized by planting with fish. Artist unknown. Source: Wikimedia Commons. However, peaceful relations were short lived. In an apparent power grab, Squanto encouraged the colonists to open trading relationships with other tribes outside the Wampanoag Confederation and at one point tried to convince the Settlers that Massassoit was planning to attack them. His goal seems to have been to alienate Massasoit and make the colonists more dependent on him. Massasoit demanded the Squanto be killed for his insolent behavior, but the Colonists refused to give him up because he was their only way to communicate with Indigenous tribes. Around that time a group of English adventurers under the command of Thomas Weston, who were trading with Plymouth Plantation, began raiding indigenous villages in the area, further straining relations. In response to these breaches of the 1621 agreement on the part of the colonists, Massasoit cut trade ties with them, causing them to enter another period of isolation and hunger. It was Squantos’ untimely death from disease that finally restored relations between Massasoit and the Settlers. By that time other tribes were becoming increasingly angered by the actions of the English adventurers and the prospect of another massacre (this was a year after the Virginia massacre of 1622) loomed. With Massasoit’s support, the Colonists were able to suppress hostile tribes and encourage the marauding English to move on. The story of the first Thanksgiving is the story of a group of weary travelers, many of them fleeing religious persecution, being swept up in an epic game of tribal chess. There was the slave who saw his chance to become the most powerful man in the land, the great leader trying to maintain order during a turbulent era and the masses of jealous rivals looking to tip the scale of prosperity. Relationships were sometimes strained, but unlike in the Virginia Colonies, warfare and mass bloodshed was avoided. This relative peace was primarily due to the actions of a great Native American leader who history has largely been forgotten: Massasoit, whose achievements were highlighted in the most famous of American feasts. Instead, the scholastic spotlight shines on Squanto, the friendly servant, whose altered story has helped to shape the perception of Native Americans as “Noble Savages” that still persists today. Thank you for reading Beyond Bones. If you found this article interesting, be sure to check out some of our other articles, in fact we have a past blog about the first Thanksgiving from the perspective of the Wampanoag that may be of interest. And if you’re looking for a place to take the family this Thanksgiving holiday, consider visiting the Houston Museum of Natural Science. We have four floors of awesome exhibits, including the McGovern Hall of the Americas, where you can learn much more about Native American Cultures. Thank you for a well written article. I am an upper elementary teacher with the responsibility to teach the “First Thanksgiving” story. I try to be truthful with the students in the fact that peaceful relations did not last (as often portrayed in the videos or short stories for elementary students). I believe your writing has clarified the inner struggles that were present between Squanto and Massasoit, the Wampanoag Confederation and other surrounding Indigenous Tribes, versus the violent English vs Native American conflicts in Virginia. I will use this information to readjust my lesson content. There are links in the blog to academic articles on the subject that might be more illuminating. I wanted to include a link to a version of William Bradford’s account, but couldn’t find a free version online. But if you feel like buying a copy, it’s a great source of first-hand information, everything in this blog was taken from it.